So the test page for “HEAVIKROME” (formerly known as Heavy Chrome) has been delayed due to a change up in art style direction. I’m researching the new style and would like to redo the page I started. 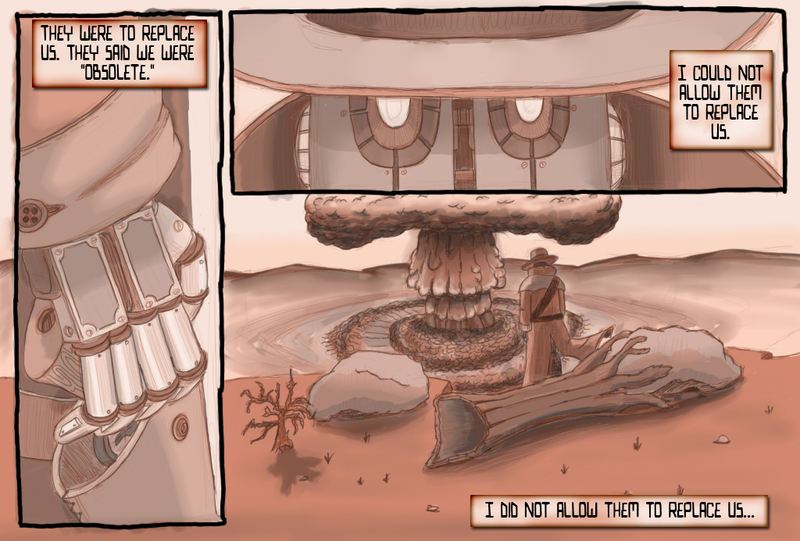 So, in the interim, I drew up the first page for “Rusted” instead. Rusted is a reinterpretation of an old video game property that my now-defunct game company was developing. The theme centered around the idea that a group of old, rusty robots was fighting against a slew of new, shiny warbots. It was a cute cartoony tale. But over the past few years, the idea “grew up” in my head, and I’ve spent the past few months reworking some basic ideas. Rusted is the result. Once again, comments are welcome and appreciated. I’m looking for comments regarding the visual style primarily (yes, the rough sketchy style is wholly intentional); these can include the figures, the coloring, even the lettering choice. Also, comments on the actual portrayed story (well, the snippet of story) are welcome. Does this page make you want to read more? Click the image for the full size pic (and easier reading). UPDATE 07/15/09 12:30am: I’ve adjusted the font of the page for easier readability. Comments on new font choice appreciated. This entry was posted on Tuesday, July 14th, 2009 at 8:43 pm	and is filed under Artwork and Design. You can follow any responses to this entry through the RSS 2.0 feed. You can leave a response, or trackback from your own site. I like the pastel colours. They help give off a feeling of ‘old’. At first I wasn’t fond of the typeface because it seemed too stylized to read for very long but at full size it grew on me. I’m madly in love with the text boxes, too. This teaser for the story is totally enough to hook me. I’m excited to see more of this. 😀 Will this be your primary protagonist? …since… he’s (it’s?) kinda badass… and I want to watch him blow things up. A lot. I like the style, coloring and text style based on what appears to be the old rusted robot point of view. I like the artwork – not quite manga but a nice style. Gunslinger meets robot meets ? The snippet does make you wonder, who, what… tell me more. I updated the font to something easier to read. While I did like the previous style, it would have been difficult on longer stretches of text. I believe the new font is easier to read while also leaning more towards the robot feel than the western feel. Very dark subject! I like the use of the pastels which give a “rust” color to the artwork. I was feeling the “rust” or the “obsolete” as was mentioned by the character. I can’t wait to see who the “us” are/is! Wow, I love the style! It’s really eye-catching and I love the dark, rusty colours ^^ Also, I’m extremely intrigued by the snippet of story, I want to know more.